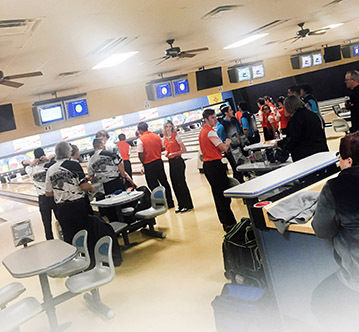 When the Artesia High School bowling team and Coach Ken Clayton sit down at the beginning of October to discuss the goals of the upcoming season, leading the way is the ever-present goal of any Artesia Bulldog team winning a state championship. In the case of the Bulldog bowling team, a close second is to capture all divisions of the Bulldog Bowling Invitational. Unlike most other sports, the Bulldog Invitational is the one and only opportunity the Bulldog bowlers have to compete in front of a hometown crowd and show they are one of the most talented and most successful high school bowling programs in the state of New Mexico. The New Mexico High School Bowling Association competes each week in four divisions: Advanced, Intermediate, Novice and Rookie. Divisions allow high school bowlers of all levels of ability to compete within their skill set. The Artesia Bulldogs, with 29 bowlers, field multiple teams within the first three divisions as the AHS bowlers’ averages have improved to a level such that no bowler qualifies within the Rookie division this season. The Artesia No. 3 Intermediate team got things started by rolling a team total 2,820 to capture first place in the division over second-place Artesia No. 2, whose 2,725 cleared third-place La Cueva No. 1 by 50 pins. Artesia No. 3 was led by Alex Harmon with games of 223 and 181, Zach Ingram (224/172), Xavier Ybarra (167) and Quinn Tilton (145). Artesia No. 2 was paced by Aaron Davis (195/175), Kaden Sallee (194/164) and team Baker games of 201, 185 and 181. Other Intermediate scores of note were Parker Johnson (184/146), Mady Pollard (144), Emmet Clark (166/142) and Rakayla Andrade (123). The Novice Division saw Artesia No. 5 win their fourth consecutive Novice Division Championship, outscoring Cleveland No. 5 2,549 – 2,483. Leading Artesia No. 4 was Ian Dodge who entered the tournament with a 122 average, proceeded to roll eight consecutive strikes for a first game 242 and followed that first game with a 178 game and 420 total series, Ana Loza (177/137), Logan McNeely (172), Kamryn Kelsey (143) and Lillynn Lewis (124). The Artesia No. 1 Advanced team found themselves in a very competitive match for the second week in a row against 6A powerhouse Rio Rancho High School. With team games of 995 and 973 the Bulldogs jumped into a solid second position going to the baker game portion of the tournament. Ethan Velo with his games of 246 and 196 and Will Davis with 216 and 188 led the way. Coy Moorhead (213/177), Justin Weddige (193/189) and Caden Brown (191/150) rounded out the Artesia No. 1 scoring. The Bulldogs produced strong baker games of 241, 195, 188, 186 and 181 however they fell just short of the Rams finishing with a solid Runner-up by a score of 3,358-3,277. “To say I am proud of these young bowlers doesn’t touch how I really feel,” said Clayton. “To know the experience level that our bowlers give up to our competition yet they compete and win every week is so very impressive.